September 16, 2015 – Montreal Canadians defenceman P.K. Subban and his foundation, the P.K. Subban Foundation, have pledged a minimum of $10 million to the Montreal Children’s Hospital, the largest philanthropic commitment ever made by a professional athlete in Canada. As part of the agreement, Subban will also assist the Montreal Children’s Hospital Foundation as a spokesperson for select Foundation fundraising campaigns and flagship events. In recognition of this extraordinary support, the Children's officially inaugurates the “P.K. 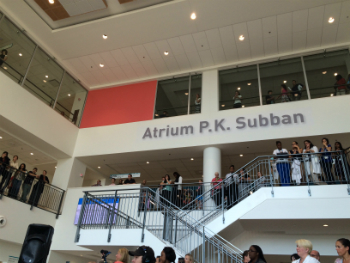 Subban Atrium,” the 486-square-meter, three-story public space located at the heart of the hospital’s new facilities. Michel Lacroix, known as the voice of the Montreal Canadians, hosted the press conference to which assisted Jean Béliveau's widow, Élise Béliveau, as well as P.K. Subban’s family. Young patients of the Children’s escorted the VIPs and got a chance at asking their role model some questions. 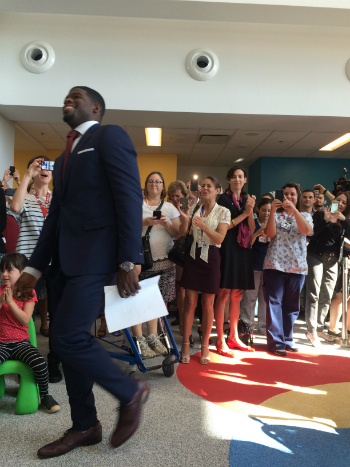 Subban drew an impressive crowd of staff, patients and media for his big announcement. This new partnership will also see the creation of P.K.’s Helping Hand, a fund dedicated to assisting vulnerable families financially devastated by a child’s illness. To further cement the partnership, Subban will join the Montreal Children’s Hospital Foundation (MCHF) Board of Directors. The mission of the Montreal Children’s Hospital Foundation is to support excellence in patient care, teaching, and research at the Montreal Children’s Hospital of the MUHC, the pediatric teaching hospital for McGill University’s Faculty of Medicine. Since its inception in 1973, the Foundation has raised almost $300 million, which has been used to transform the lives of sick children through innovative research and teaching projects, and cutting-edge care. The Foundation’s Best Care for Children campaign raised $105 million to help build the new Montreal Children’s Hospital on the Glen site. For more information, please visit childrenfoundation.com.